Rising dramatically out of the Firth of Clyde the volcanic plug of Ailsa Craig reaches a height of 388 metres (NX 019 999) and creates an imposing spectacle for all those travelling south from Ayr. “Paddy’s Milestane” lies just over 19 km west of Girvan and is well known as a former source of curling stones, fashioned from its granite. Until recently, the seabird colony faced problems largely due to the presence of Brown Rats. The well-documented removal of these (see Ailsa Craig – Before and After the Eradication of Rats in 1991 by Bernard Zonfrillo) has further improved the situation for some breeding species e.g. Herring Gull and Fulmar . 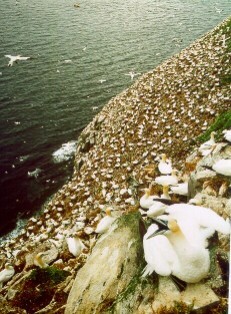 The species which gives rise to much of Ailsa Craig’s importance is the Gannet . Since the 1950s when an estimated 5000 pairs bred on the island, the population has steadily risen to around 5,000 pairs by 2000. Designated as an SSSI the main problem facing those wishing to visit the island is a combination of transport and weather. 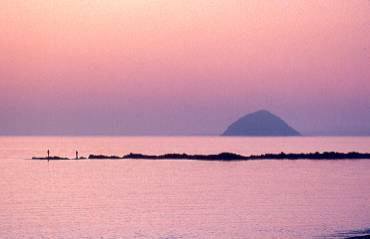 Girvan is easily reached by both road and rail, but very few boats run regular trips. The best of these is organised by Mark McCrindle whose boat, the Glorious , can take up to 12 people. May and June are the best months to visit, but the position of the pier on Ailsa Craig makes landing impossible if the wind is off the east. The preserved sea-going paddle-steamer Waverley provides another excellent chance to view the seabird colony, along with other seabirds during summer months as it runs regular trips from Ayr and other ports along the Clyde. This entry was posted in Locations - South Ayrshire on 05-Oct-2003 .